Baingan bharta (pureed roasted aubergine masala) is one of my most favoured vegetarian Punjabi dishes. Traditionally the aubergine is roasted in a tandoor or cooked on the hob but i think roasting it in the oven is far easier. I grew up eating this dish. When visiting my grandma in our summer holidays, aubergines grew in abundance on the estate hence baingan bharta was frequently on the menu. We never put cumin seeds or garlic in this dish because they can quite easily over power the delicate flavour of the aubergine. The sweetness of the peas really enhances the dish and completes it. Its tastes phenomenally with freshly made chapati’s and raita. 1Preheat your fan oven to 200 degrees Celsius. Rub a little oil all over the aubergines, place on a foil lined dish and roast for 45 minutes. 2In a large saucepan add the oil then heat on a medium heat, add the onions and salt. Cook the onions for 6-8 minutes or until the onions are translucent and start turning golden brown. 3Add the ginger and cook for a further 2 minutes stirring frequently. 4Add the dried spices: Kashmiri chilli, turmeric, coriander powder and cumin powder. Reduce the heat to low and stir for a minute. 5Increase the heat to medium and add the chopped tomatoes and cook for 4 minutes stirring frequently. 6Add the frozen peas, cover and cook for 3 minutes. 7Once the aubergine is cooked remove it from the oven and allow it to cool for 5 minutes. gently and carefully remove the outer skin, stalk and place all your aubergines into a mixing bowl. 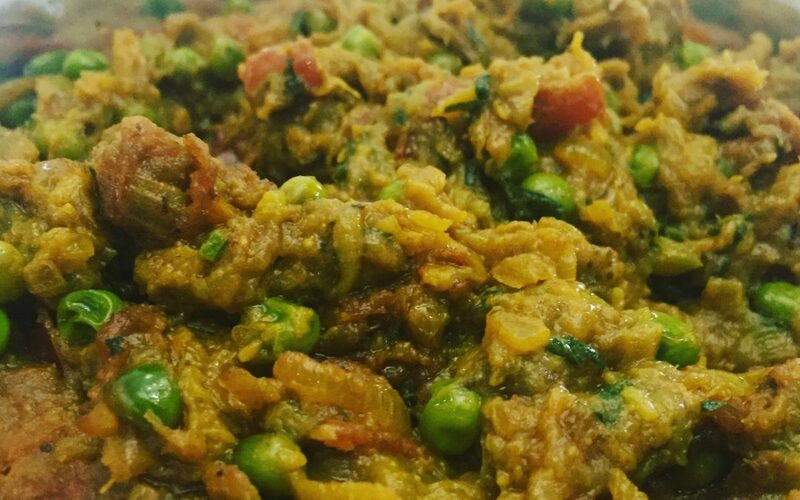 Mash the aubergine with a potato masher then add it to the masala and peas mixture. Mix well and incorporate the aubergine and masala well. Cook the mixture for 5 minutes. 8Add the fresh coriander, garam masala and mix well. Serve with fresh chapati's and raita. What drew me to these recipes were the wonderful pictures. I am a home cook and I cook daily for family. I have made Bharta many times before and every time it tastes different. My Bharta has not been bad but tasted just ordinary. I followed this recipe last week and the difference was obvious. It turned out amazing! I have started to believe that to cook something properly, you have to follow the recipe and not “wing it” or use andaza when using ingredients. The key of a good recipe is that it helps enhance the natural flavor of the main ingredient(the eggplant) and not mask it. This recipe accomplishes just that and is an excellent method to make a Punjabi favorite that I ate growing up. The natural smoky sweetness of the roasted eggplant with an even enhanced sweetness from peas and onions made for a superlative dinner last week. We served it with rotis and boondi raita. Thanks! I will be trying several of your other recipes soon.